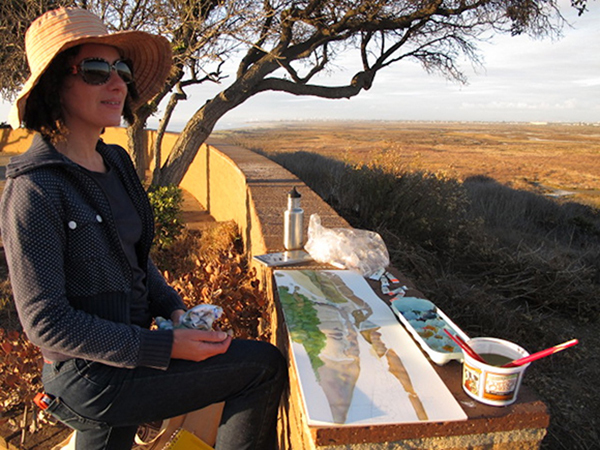 Last November, a group of artists, art historians, students, a U.S. veteran, and others gathered to sketch, walk along and otherwise metaphorically trace the US/Mexico border wall. With armfuls of drawing supplies, we hiked 1.5 miles through San Diego's Border Field State Park to reach a mesa with a scenic view of the ocean and hills bisected by the wall. Our destination that day is at once a line on a map, a survey marker on the ground, a series of GPS coordinates, a row of two metal fences identifying two distinct states with their own military forces and governments. It marks the place where the most southwestern edge of the U.S. touches Mexico. Incendiary Traces went to draw this border line as part of its continued investigation of the links between landscape and seemingly remote international conflict, as well as the role of drawing in establishing national identity. Consider our drawing metaphorically here -- it may include many forms of tracing the landscape, from walking to surveying, watercolor painting to civil engineering. Friends of the Jardín Binacional de Amistad / Binational Friendship Garden might also include tending their circular garden, symmetrically bisected by the border barrier, as its own form of mark making. They joined us there and participated in the conversation, which took place through the fencing. It is tempting to think about the ease with which one might be able to cross the border if there were no fence because the terrain on both sides is contiguous. Though today's boundary is physically apparent in buildings and infrastructure, over 100 years ago the first International Boundary Commission surveyors had to locate a political division that was not embodied on the ground. Until the 1990s, the border line was unmarked on the ground here except for an obelisk-shaped monument from the first survey. Friendship Park, a small park circling the border marker, emphasized this openness. Established in the 1970s by first lady Pat Nixon, it was intended and used as an international gathering place. This changed in the 1990s when the first border wall was built. 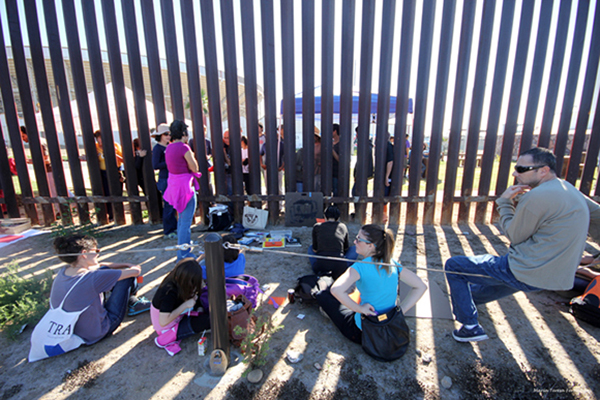 Prior to the event, we had to obtain permission from the Border Patrol (U.S. Department of Homeland Security) to spend time drawing in the D.M.Z., the demilitarized space between the first and second fences just north of the border line. Built five years apart, the two fences and the accompanying electronic and human surveillance systems form an imposing barrier. We entered the DMZ through a normally locked gate at Monument Mesa in Border Field State Park. Left: Drawing by Susanna Newbury. Right: Drawing by Berge Zobayan. However, our causal dialog was not thwarted by the border architecture. Participants on both sides of the fence came together to hear art historian Susanna Newbury give a synopsis of her research on the history of demarcating the border after the treaty of Guadalupe Hidalgo. Artist Alessandra Moctezuma thoughtfully translated in Spanish. After some bilingual questions and answers, Dan Watman and Elizabeth Chaney spoke from the Tijuana side of the fence about the history of Friendship Park and the Binational Garden. More conversation followed. Then everyone got to work gardening, drawing, walking, looking, and talking. From the mesa, visitors and U.S. Border Patrol alike take in an unobstructed view of the border architecture spanning the landscape as far as one can see across the grassy hills to the east and into the ocean to the west. We can gaze at the horizon alongside patrolmen posted there to look and watch 24/7. While visitors contemplate the natural beauty and U.S. Department of Homeland Security infrastructure, Border Patrol agents watch the ocean for signs of illegal border crossing by water. Though the border fence looks impassible and infinite across the landscape to the east, the fence abruptly ends in the water close to the shore at low tide, which makes a crossing by water look surprisingly easy. However, as one patrol agent told me, a migrant swimming, boating or surfing around the fence has nowhere to hide in the open water or beach. To evade detection, smugglers (of drugs and humans) take boats out past the visible horizon. On the water, the U.S. Coast Guard does the watching from boats and helicopters. Incendiary Traces "traced" the space alongside these agents. However, for the agents, tracking this impressive site with their eyes and vehicles is a routine and seemingly tedious task. For us, the imposing and sprawling physical scale of the border fence and surveillance system illuminated the immediacy of international conflict, yet it was mitigated by our communal spirit and our own acts of tracing the landscape. Hillary Mushkin is a visual artist exploring contemporary and historical intersections of art, visual culture, social and political consciousness. She works in studio and post-studio forms including drawing, media, and interactive formats. Mushkin frequently collaborates with others from fields including poetry, architecture, and digital media.